BOERNE, Texas — The King of Country Music George Strait and long-time friend and Texas businessman Tom Cusick hosted their seventh annual Vaqueros del Mar Invitational golf event last week (Thursday, Oct. 26) at Tapatio Springs Hill Country Resort in Boerne, Texas raising a record $1,533,450 throughout the golf tournament, charity concert, and auction (with additional monies coming in post-check presentation to surpass the previous year’s record of $1.2 million, helping notch over $1.5 million by the night’s end). 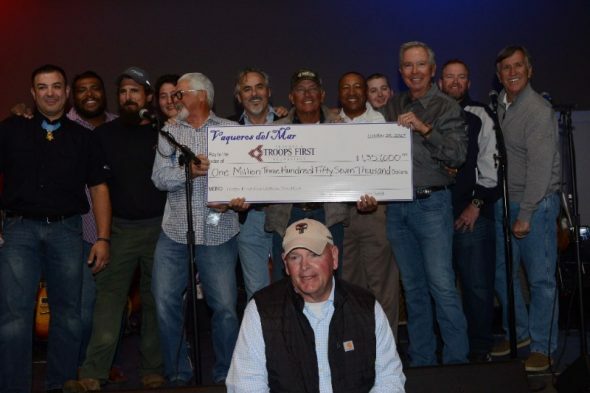 The annual event raises funds for Feherty’s Troops First Foundation, which directly benefits those who fight to keep us free, the wounded military service men and women. The foundation was founded by Rick Kell and on-course reporter for the PGA Tour and former professional golfer David Feherty in 2008 after Kell spent time with patients recovering from serious combat injuries. A known supporter and former member of the U.S. Army himself, Strait teamed up with Cusick and the foundation as a way to give back in a grand way. The Invitational has now raised more than $4.5 million for military personnel wounded in action since it was created in 2011. The popular event featured a live auction and a star-packed jam session with Strait and several of his friends in the music business including Dean Dillon, Jamey Johnson and Ray Benson of Asleep at the Wheel. Military support from Strait and Cusick reaches beyond the links. In June, Strait and Cusick cut the ribbon on another project, “The Leon Petry Village of Honor,” which was funded by Feherty’s Troops First Foundation. The Village of Honor is located in Washington D.C. in close proximity to Bethesda Naval Hospital and offers transitional housing for wounded service men and women, and their families free of charge which they undergo the long and painful process of rehabilitation from their combat injuries. David Feherty and Rick Kell founded the non-profit organization in August 2008 to provide assistance to soldiers who have been wounded in combat. With unduplicated relevance as a core principle, Feherty and Kell have created several programs and specialized events designed for wounded soldiers and their families that address relationship building, mentoring, reintegration and looking forward. For more information, visit www.troopsfirstfoundation.org. San Antonio’s original destination resort, Tapatio Springs is nestled in the heart of the Hill Country on 220 acres among rolling hills, wildflowers and limestone cliffs. It is the ultimate family-friendly, affordable destination with a new $1.0 million resort pool and bar, an 18-hole championship golf course recently restored by Tripp Davis and Associates, casual, full-service dining, live music event series and over 10,000 square feet of fully-renovated event space. Tapatio Springs is located at 1 Resort Way, Boerne, Texas 78006. For more information, please visit www.TapatioResort.com or call (855) 421-0211. With an unmatched 60 singles hitting the top of the charts – more than any other artist in any genre – during the span of his 30-year career, Strait is the undeniable “King of Country Music.” He has collected 33 Platinum or multi-Platinum-selling albums, more than any country artist and third across all genres behind only the Beatles and Elvis Presley. Strait is the only act in history to have a Top 10 hit every year for over three decades and has sold nearly 70 million albums and earned more than 60 major entertainment industry awards including induction in the Country Music Hall of Fame in 2006. In 2014, he shattered the North American indoor concert attendance record by drawing 104,793 concertgoers to his The Cowboy Rides Away Tour finale at AT&T Stadium in Dallas. Strait performed six sold-out shows at T-Mobile Arena in 2016 as part of his Strait to Vegas exclusive concert series, extending his limited engagement into 2017 with an additional 10 shows. Strait continues to perform live engagements with two remaining shows at T-Mobile this December, a pair of performances over Big Game Weekend, February 2-3, as well as additional appearances in 2018 on June 3 at Frank Erwin Center in Austin, Texas, (tickets go on sale Friday, Nov. 3 at 10:00 AM/CT); and June 1 and 2 at BOK Center in Tulsa, OK. Visit www.GeorgeStrait.com.